It's 14:23 in Pea Ridge, USA right now. 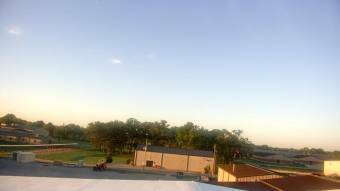 Pea Ridge High School A webcam in Pea Ridge, Arkansas - camera location: Pea Ridge High School. Bentonville, Arkansas: Fulbright Junior High School, 7.8 miles away. Garfield, Arkansas: Whitney Mountain Lodge, 7.8 miles away. Rogers, Arkansas: KNWA - Rogers Bureau, 8.5 miles away. Bella Vista, Arkansas: Cooper Elementary, 9 miles away. Fayetteville, Arkansas: Mt. Sequoyah, 26.4 miles away. Fayetteville, Arkansas: Hotel Chancellor, 26.4 miles away. Fayetteville, Arkansas: Kessler Mountain, 26.4 miles away. Siloam Springs, Arkansas: Allen Elementary School, 30 miles away.